【Length & Quality】There are a total of 12 fake ivy and each artificial English ivy is about 7 feet. The warm white battery powered copper wire string lights is about 30 feet long. 【Exquisite & Flexible】The leaves garland are made by dyeing and cutting the silk, exquisite and delicate; the stems are made of plastic, flexible and durable. 【Hang anywhere】With faux ivy hanging down to offer extra cover and a great naturalistic look. Providing you with a comfortable and warm environment. the vivid texture makes it appear to be an actual plant. Best for adding a natural touch in your decor. 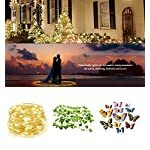 >he battery operated led string light can be utilized indoor or out of doors, doesn’t contain batteries and need 3 AA batteries to operate. immediately stick the butterfly at the IVY. Our Faux ivy garland with LED string lights and Decal Butterfly is ideal for decorating each and every place and each and every occasion. hang it on a chandelier or stair railing. It cannot only beautify the environment but in addition make you’re feeling good. to your child and creating a wonderful rest place to your circle of relatives. 3.Best for Special Events. 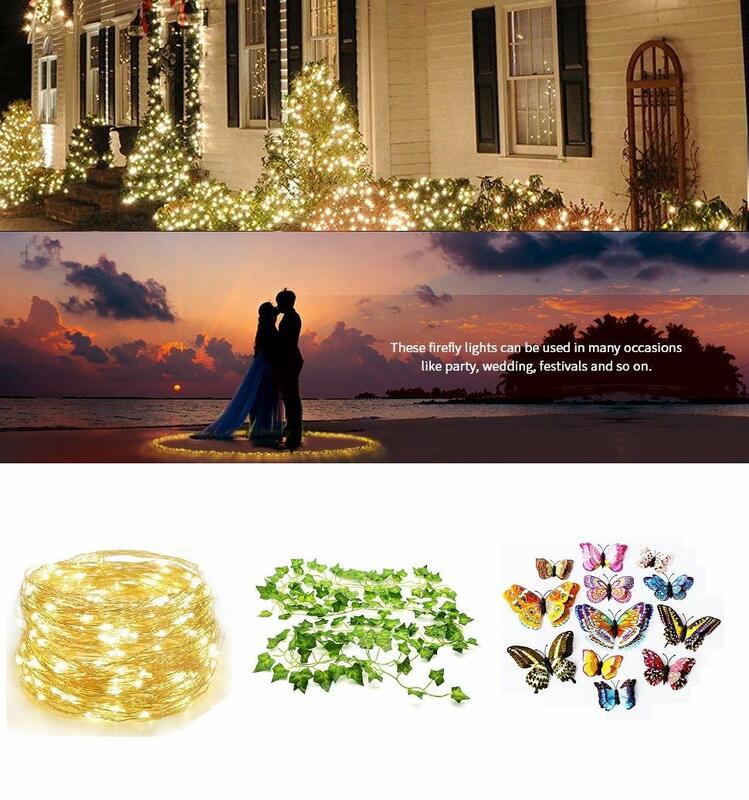 Such as Wedding, Party and Festival Decoration. Make the romantic atmosphere and the cheerful atmosphere stronger. 【Length & Quality】There are a total of 12 fake ivy and every artificial English ivy is about 7 feet. The nice and cozy white battery powered copper wire string lights is about 30 feet long. 【Hang anywhere】With faux ivy hanging down to supply extra cover and a really perfect naturalistic look. Providing you with a comfortable and warm environment. 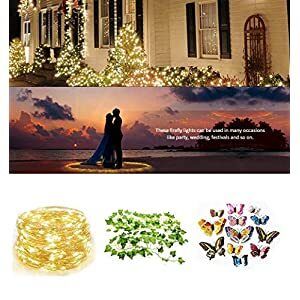 【Best for decorating】Regardless of where, what occasion, with ivy leaves, plus vine lights and artificial butterflies to brighten, can create a different atmosphere for you. 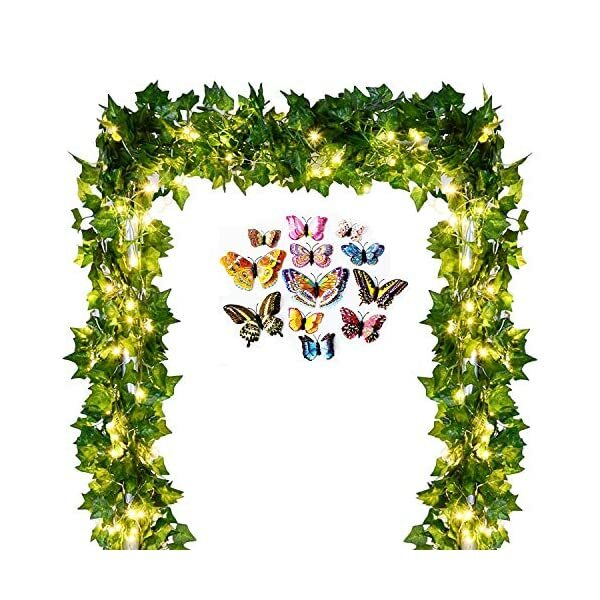 【What You Get】 Artificial IVY LED Set. 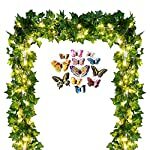 12 Pack ivy wall hanging + 1 garland lights + 12 Butterflies + 24 MONTHS UNCONDITIONAL RETURN OR EXCHANGE !